Sorry again for the lack of posts in the last few weeks. I just finished producing a music video for Passover, called "20 Things To Do With Matzah". It doesn't have much to do with lowercase L, but one of the YouTube comments did. I'm happy to know my audience are LOl! Lowercase L reader Violet found this at a Mexican taqueria. 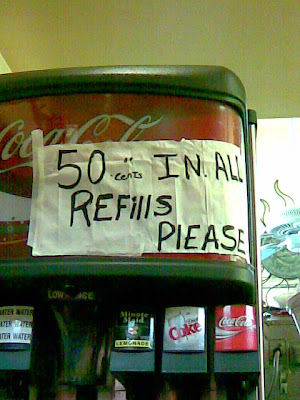 I would ask the author of this sign to PlEASE explain why he got ALL correct, but PlEASE is not at all correct. And REFillS is not so bad, at least it's possible to distinguish the dotted i from the lowercase L's. And this is the first sign that was actually posted high on Coke. 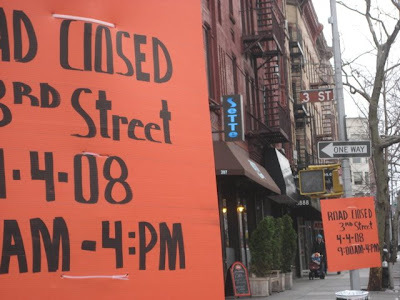 On the exact same street intersection here in Park Slope, Brooklyn, using the same bright orange colored boards, apparently the same author was hired to construct these ROAD ClOSED signs and post them on 3rd Street and 7th Avenue almost exactly a year ago. The signs certainly are different than they were last year, since the closure time is now 4pm instead of 3pm, and this year they were written in a bold style. So this author either has never seen this blog to learn a lesson in improper use of lowercase L's ... or he is fully aware and choses to mock me.